Here in the hills where the wild sheep grow, tended by rain soaked winds and sun kissed clouds, the grass grows impossibly green. It rolls in velvet folds across the low green lands, giving way to a thick plaid of golden frosted heather and bracken, as the earth rises to meet winters crumbling mountain stones. There is a line which runs all across the high slopes, above which the bare rock heads of the mountains peep through the soft coloured blanket of soil and plants. The bald grey and black of gabbro and basalt, running in frost shattered rivers of scree, towards the soft fertile pastures of the glens far below. On the highest peaks, soft wool clouds dust the cold stone mountain tops with icing sugar snow daily. The clouds drift through on the wings of wind which may have begun thousands of miles south among emerald Caribbean isles. We can only wonder what tales are whispered by the snow filled wind into the stone ears of the mountain peaks, and what the mountains say back to the passing breeze. What we do know for certain is that the wind brings the rain and the snow clouds, which water the thirsty grass, which feeds the hungry sheep, which grows the warm soft wool, which is knitted into gloves and jumpers to keep our soft bodies warm…..in the biting cold wind…….which brings the rain and clouds. 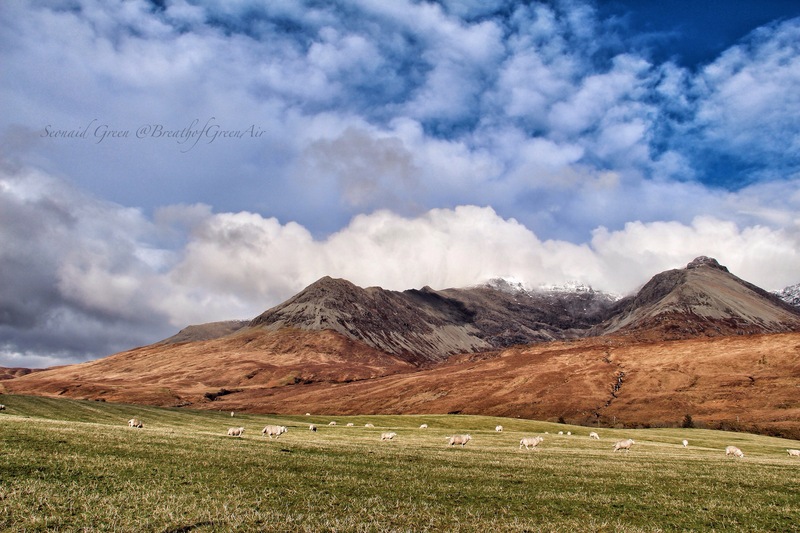 The photos are taken in Glen Brittle on the Isle of Skye, Scotland in response to this weeks WP challenge ‘landscape’. 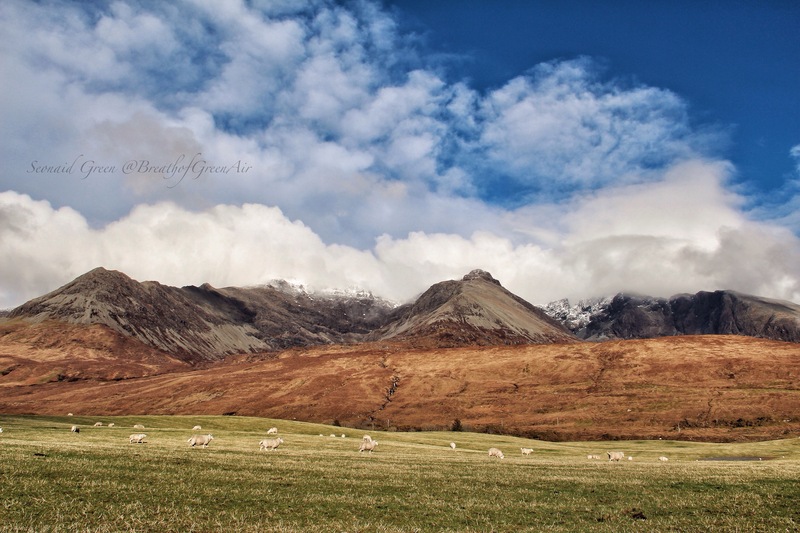 This entry was posted in elemental, nature photo, weekly photo challenge and tagged earth, Isle of Skye, landscape, mountains, nature, photography, postaday, scotland, sheep, weather. Bookmark the permalink. Such lovely images and poetic prose. A delightful post indeed. The layers of color are so vivid! Beautiful! Now I will appreciate my pure wool knitwear even more than I did before, although I don’t have any Scottish wild-sheep wool knitwear but mostly Nordic, which may also be from wild-sheep wool. I’ve always wanted to visit the Isle of Skye but have never had the chance. It looks so peaceful and far away from the crowds that I’ll never get used to in the SE of England. I’m lucky in that I live on a hill, with the South Downs behind me and a view over the rooftops to the sea, so I can escape from the crowds up to a point, but I can always hear the traffic droning away in the distance. My favourite time of day is at dawn, when it’s comparatively quiet. And we will return to the earth . . . Indeed, and such places are becoming rarer in the 21st century…. How beautifully you tell the story of this wild landscape Seonaid!! I love the lines about growing sheep 🐑 😀 Have you read Terry Pratchett’s Tiffany Aching series? If not you so should!! I have to admit that I cried when I read his final book! I love the Tiffany character, so intune with the landscape and its inhabitants 🙂 The depths of those mountains really reminded me of her! A rare gift indeed! I met him at a couple of booksignings and he was such a quiet unassuming man. I’ve loved everything he’s ever written either solo or with others. He’s worked with some exceptional artistic talent too! It’s a legacy that will live on through the centuries I think. I hope!! I agree with you, Sarah!